As evolution was said to be “in the air” in the 1850’s, today an epochal revolution in our conception of what kind of universe a valiant people and special planet find themselves in seems much underway in a new conducive spacescape. The old gloom of a mechanical, particulate, entropic cosmos, with life but a random tangent, is in waning disarray. These disparate overview sources, backed by the 5,000 entry website, express a quite different, self-developing, life-friendly, unfinished genesis just awakening to our phenomenal recognition and discovery. We coin Cosmome for a title, in accord with the outline, to represent its natural, parents to children, genetic code. 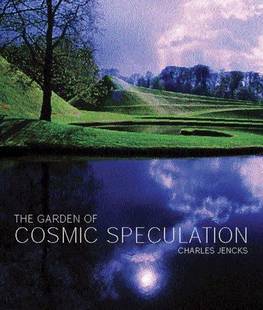 The image is a work by Charles Jencks and friends as one luminous example of such a procreative uniVerse. Evolution and Development of the Universe. www.evodevouniverse.com. We are pleased to note a prescient conference held in Paris, France on October 8-9, 2008, whose summary theme is expressed in the quote. Speakers such as James Gardner, John Smart, Laurent Nottale (search herein), Peter Winiwarter, and others offered a forward edge exploration of our cosmic Copernican Revolution to a more life and human friendly creative organic universe. The Program and Abstracts can now be viewed at: http://evodevouniverse.com/uploads/1/18/EDU2008Program.pdf. The underlying paradigm for cosmology is theoretical physics. The EDU research community explores how it might be extended by including insights from evolutionary developmental biology. In the neo-Darwinian paradigm, adaptive evolutionary development allows the production of ordered and complex structures. More specifically, we can distinguish evolutionary processes which are contingently adaptive and developmental processes which produce systemically statistically predictable structures and trajectories internal to the developmental cycle. By analogy with the evolutionary development of two genetically identical twins, would two initially parametrically identical universes each exhibit unpredictably separate and unique evolutionary differentiation over their lifespan, and at the same time, a broad set of predictable developmental milestones and shared structure and function between them? More generally, can we model our universe as an evolutionary developmental system? Human Universe. www.newscientist.com/issue/3019. An online posting for the May 2, 2015 issue of the popular British weekly The New Scientist, with a cover story by this title. For some context, its intent is quite different from a 2014 book by physicist Brian Cox with the same title, which touts a pointless multiverse. In the mid 2010s, due to Kepler planet findings, along with quantum, complexity, network, neural, informational, and more scientific advances, a revolutionary alternative is in the air which this report tries to glimpse. It is just being realized that sapient, collaborative persons on a special bioworld Earth in a unique solar system may indeed be the only knowing, capable awareness in the whole evolutionary cosmos. By this vista, we peoples altogether can aspire to an awesome role and purpose of deciding and co-creating the fate and future of this self-chosen universe. An editorial opens with 21st century affirmations by leading thinkers such as Martin Rees, David Waltham, and Dimitar Sasselov, see quotes below. Eight sections course from Was the Universe Made for Us? (Anthropic Principle, see more quotes) and Does Consciousness Create Reality? (Wheeler’s participatory model) to Could We Colonize the Stars, Engineer the Universe, and Could We Become Gods?. Even though humankind, great Earth, and this sunny star home may be the original or only winner of a stochastic contingency, with nascent, limitless cognitive and technical potentials, a subtitle proclaims “The Universe is Ours.” But it is noted throughout that such a fantastic vista is possible only if men can stop fighting, mitigate many threats and intentionally achieve a global sustainability. Initiative for the Theoretical Sciences. www.gc.cuny.edu/Page-Elements/Academics-Research-Centers-Initiatives/Initiatives-and-Committees/Initiative-for-the-Theoretical-Sciences. A new center based at the City College of New York CCNY as the marriage of physics and biology begins to reveal and qualify a revolutionary procreative universe. Physicist William Bialek was a co-founder and is present director, along with international contributors such as Irene Giardina, Andrea Cavagna, Sriram Ramaswamy, as they study self-organizing animal groups, active matter, and so on. Subject areas are Brains, Minds, and Models, Condensed Matter Physics and Quantum Computation, Chemistry, and Evolutionary Theory. A good article on this whole project, which cites this institute, is The Borders of Order by Philip Ball in the New Scientist for April 28, 2014. National Geographic X-Ray Earth. http://channel.nationalgeographic.com/episode/x-ray-earth-5102.. A TV special that first aired in spring 2011 about how our planet is busily installing electronic sensors everywhere and every way to monitor and maintain a viable environment. Happening much on its self-organized own, such surveillance from cell phones to GPS satellites takes on the guise of a rudimentary metabolic homeostasis. But within the two hour show, a novel, profound scientific advance and synthesis, with sure global consequence, became evident. The work of Brian Enquist, University of Arizona ecologist, and of physicist Geoffrey West, former Santa Fe Institute president, along with many colleagues, is shown to divine and quantify as not before a natural geometry that iteratively stretches from leaves to London. Enquist’s team reports on how a whole forest, and wider biota, repeats the form and function each plant with an optimum fractal self-similarity. West worked with Enquist, and ecologist James Brown (search names) over the past decade to discern this implicate mathematics. He has since, with Luis Bettencourt, Jose Lobo (search) and others, extended this universality on to human habitations from villages to a metropolis. Again the same animating patterns and processes recur across a wide nested scale. These 21st century findings of as above, so below, “a world in a wild flower,” at last confirm nature’s grand affinity from universe to human. And further theme builds toward the end of the airing. By any measure and imagination, precious earth in this view appears quite alive, the whole scintillating biosphere and upstart cultural noosphere is much a living organism. In closing, it is wondered if by all this sensory instrumentation, such a personal planet might attain a modicum of self-awareness. This website bibliography and anthology tries to document that a worldwide humankind is on the verge of her/his own knowledge and discovery, which we urgently ought to realize, read and avail. The Edge 2011 Question: What Scientific Concept Would Improve Everybody’s Cognitive Toolkit. http://edge.org/annual-question/what-scientific-concept-would-improve-everybodys-cognitive-toolkit. This peripatetic Edge salon of literary agent John Brockman annually poses a topic for scientist and cultural commentators to weigh in on. Some 164 responses are now posted this January, most a disparate array of pet interests and opinions. But a few items can put our conceptual and social impasse in sharp relief. (Our mental faculties are not “toolkits”). Astrophysicists Sean Carroll and Marcelo Gleiser, whose 2010 books are noted herein, harden their claim of a pointless multiverse whereof earth, life, and human are wildly improbable accidents. And then it is said isn’t this grand for it frees us to make up own valuation. Does this make sense if there is no real sense to make? But another voice, science writer Matt Ridley (The Rational Optimist), avers that human beings are extraordinary due to the historical and lately global “collective intelligence” of all peoples together. This later view of such a worldwide discovery of an alternative creative, organic universe is the root rationale for Natural Genesis. Adams, Alyssa, et al. Physical Universality, State-Dependent Dynamical Laws and Open-Ended Novelty. Entropy. 19/9, 2017. Arizona State University theorists Adams, Angelica Berner, Paul Davies and Sara Walker continue their endeavor to identify vital propensities which ought to be there because we latecomers are here. With colleagues Chiara Marletto, David Deutsch, and others, the task is to discern a generative mathematics to which life’s procreative emergence can be traced to and explained by. The issue is not so much whether this innate source exists, but much about how can it be drawn out and synoptically perceived from technical abstractions to real understandings (cosmic elephant) of an animate evolutionary creativity going forward. Allen, Roland and Suzy Lindstrom. Life, the Universe, and Everything – 42 Fundamental Questions. Physica Scripta. 92/1, 2017. An illustrated lead article in a Focus Issue on 21st Century Frontiers by Texas A&M University and Uppsala University physicists which avails Douglas Adams’ famous number to list prime areas such as black hole phenomena, cosmic inflation, quantum photonics, an anthropic multiverse, spacetime consistency, universal life, why consciousness, and so on. But within the present mindset, they remain as fragmented topics with still no wonderment about what it altogether might be and mean, which we Earthlings struggle to imagine. Ambjorn, Jan, et al. The Self-Organizing Quantum Universe. Scientific American. July, 2008. Noted more in Quantum Cosmology as a revolutionary theoretical witness of a natural genesis. Anderson, Walter Truett. The Next Enlightenment: Integrating East and West in a New Vision of Human Evolution. New York: St. Martin’s Press, 2003. “What miracle is this?” writes Anderson that conscious beings arise out of 14 billion years of cosmic to earthly to human evolution. In response he sketches a 21st century path for the perennial wisdom quest that seeks to join Western rational empiricism with Eastern mysticism. The eclectic work includes appreciations of the universality of complex adaptive systems, a nascent global superorganism and its brain, and our protean, congressional, postmodern self. Arthur, Wallace. Life through Time and Space. Cambridge: Harvard University Press, 2017. The National University of Ireland, Galway zoologist and author (search) achieves an engaging cosmic and Earthly tour by way of From Stars to Embryos, Cycles of Life, In the Beginning, Structures and Functions, From Boulders to Brains, Milestones of Discovery, and Endings and Enlightenment sections. His embryologist bent is evident with allusions of cosmic evolution as an “embryogenesis” whereof living beings, and our human witness, organically arise and develop from an original point, aka “from atoms to aliens.” The evolutionary import of ramifying neural anatomy and intelligence are well covered both or our home planet, and imaginations about extraterrestrials. Although not overtly cited, one get inklings of a global gestation reaching fruition as our humankinder might finally gain a salutary and palliative vision. Artson, Bradley Shavit. Life of the World: Beyond Mind/Body Dualism to Embodied Emergence. Hebrew Union College Annual. Volume 79, 2008. The American Jewish University, Chair of Rabbinic Studies, scholar and author achieves an insightful review of our revolutionary moment between a mechanical scheme that drains vitality, mind and spirit from persons and populace, and a dynamic relational, analogic unity of transcendence and immanence. In so doing a once and future Neoplatonic essence is invoked by which to revive the numinous complementarity of body and soul. Indeed the mystical Zohar teaches such a divine heavenly and earthly continuity, not either/or opposition. A 21st century worldwide, palliative wisdom is seen as coming together in our midst if we might allow our destiny as intended selves who are to heal, resolve, and create this procreative family cosmos. See also Rabbi Artson’s chapter “Holy, Holy, Holy! Jewish Affirmations of Pantheism” in Panentheism Across the World's Traditions (2013), and his God of Becoming and Relationship: The Dynamic Nature of Process Theology (2016). This paper will consider the dominant systems of ideas – a dualistic metaphysics that dichotomizes mind and body – explicate its inadequacy and harmfulness for the present, and advocate a different nexus of ideas to allow the continuing conversation about ourselves, our place in the world, and a spiritual sense of unity and meaning to emerge in a way that does not require us to deny what we know from other sources, denigrate our world and ourselves, or maintain a false hierarchy based on gender. The solution that I will sketch integrates three mutually-supportive sources: cognitive science, metaphor theory, and panentheism and process theology. Auerswald, Philip. The Code Economy. A Forty-Thousand Year History. New York: Oxford University Press, 2017. Quite more than another business book, the George Mason University professor of public policy makes strong case for the actual doubleness of our human cultural, commercial, and evolutionary existence. By this view, the overt what-happenstance of the daily world can be attributed to some manner of a prescriptive source – blueprint, project plans, algorithm(s), and so on. While this soft/hardware, aka geno/phenotype, Leibniz’s universal alphabet, script/score duality is known, Auerswald adds a new cogent emphasis to the importance and implementation.